9500 Sith Fury-class Interceptor is a Star Wars Expanded Universe-themed set released in 2012. Like 9497 Republic Striker Starfighter, this set is based on a starship from The Old Republic, namely the Fury-class Imperial interceptor. The set is mainly built up of light stone grey and black pieces. The cockpit is a printed transparent windshield piece, which can be moved up and down and can seat one minifigure. The top of the main hull area is designed with two spearguns on the back. At the back of the ship, behind the cockpit is the passenger seating area, where the top of the vehicle can be moved up and down to seat two passengers. On the left and right of the seating area are two main thrusters. On the left and right of the ship are the wings, triangular shaped light stone grey pieces covered with black tiles, antennas, and radiators. The wings actually have two sections on each side, the front wings and the back wings. The front wings are stationary, and cannot move, however, the back wings can be folded outwards and inwards for landing mode. Between the wings are long printed pieces, depicting lights and equipment. On the outside of the wings, at the outmost left and right, the vehicle is equipped with four flick-fire missiles, which are longer than most. 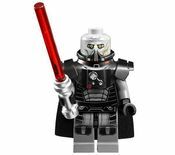 The set contains Darth Malgus, a Sith Lord. Darth Malgus is colored grey, and has menacing yellow eyes. He has a scar on the left side of his face from his encounter with Satele Shan. He has wrinkles around his frown and on the top of his head. He wears a black respirator that he wears to help him breathe, printed with silver connecting spheres on the front of the respirator, along with red lines. An exclusive black cape with one hole instead of two holes can be worn under his respirator. His torso is black and grey, and features the same design on the respirator on the top part of his torso. The bottom part of the torso is printed with grey armor lines. The back design of the torso is also printed with black and grey armor lines. His arms are both grey with black hands. He is armed with a Sith lightsaber. His leg connector piece is black, and is printed with small grey triangle and trapezoid designs. His legs are grey, but also partly black as the top has black armor lines continue down from his torso onto his legs. Sith Troopers are also included with the set. The Sith Trooper is colored light nougat, and his helmet can be removed, which reveals a flesh-coloured face and a serious expression. The helmet is black, and is circular at the back but angular at the front, with the lower silver helmet area protruding from the rest of the helmet. It is also printed with a white Sith Empire logo above the visor and red lines, to match the rest of his armor. His torso is black, and it has dark grey and red lines from the top to the bottom of the torso. It is printed with a life support design, which is a black box with a red circle and blue lines inside. Underneath that is a small device with two very small light red circles. The utility belt is printed on his torso. 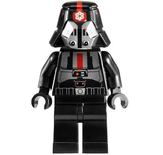 His arms are black, along with his hands, and is armed with a blaster. He has regular black legs. The Sith Fury-class Interceptor, or Fury-class Imperial interceptor was commonly used by Sith Warriors and Inquisitors as transport vehicles within the Sith Empire during the Great Galactic War and the subsequent Cold War. The Interceptor was designed for important missions, so for this the interior included a large communications room with a holo-projector, as well as cabins for the crew and a conference room. Vindican and his apprentice Malgus used an interceptor during the Fall of Korriban. It was armed with laser cannons. This is a description taken from LEGO.com. Please do not modify it. 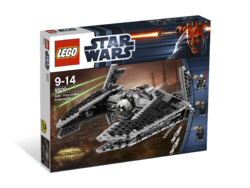 (visit this item's product page) Attack the Republic with the Sith Fury-class Interceptor! Facts about "9500 Sith Fury-class Interceptor"
This page was last edited on 9 January 2016, at 22:46.